First impressions are lasting impressions and my first impression about the Nurburgring is that it’s absolutely unreal! 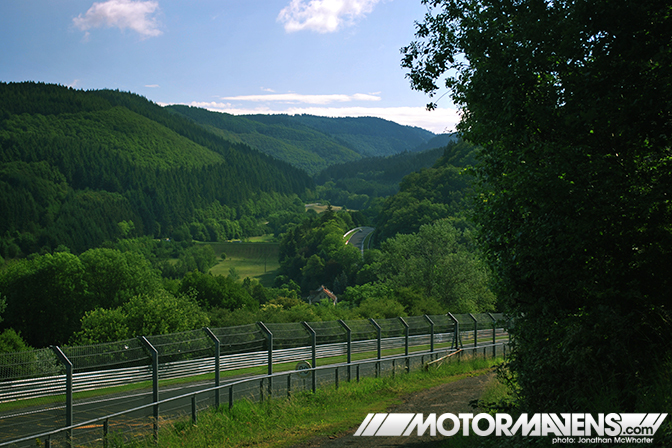 As you make your way into the Eifel Mountain region of western Germany, it becomes more and more difficult to comprehend that something like the Nordschleife exists. The cascading mountains covered in dense forest, although the perfect place for your dream course or a video game, doesn’t seem a feasible locale for a high speed, high stakes race track. I would liken the feeling to going to an amusement park as a kid and trying to fathom that so much awesome could be in one place. In today’s world of rules, regulations, and protocol, this place should not happen (at least not easily and with lots of paperwork). 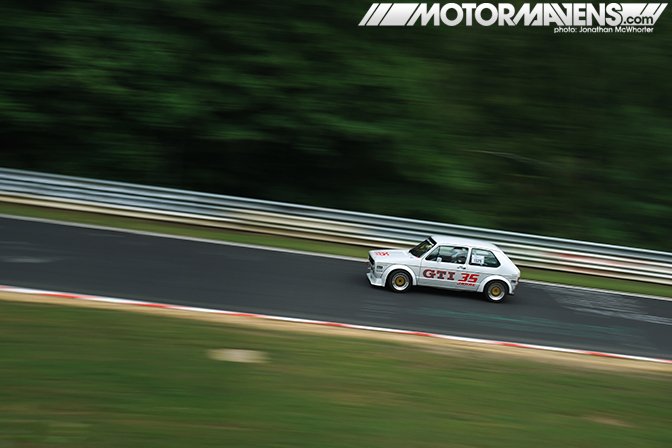 However, the automotive dreamland that is the Nurburgring was conceived in a time when they only cared about one thing: racing. 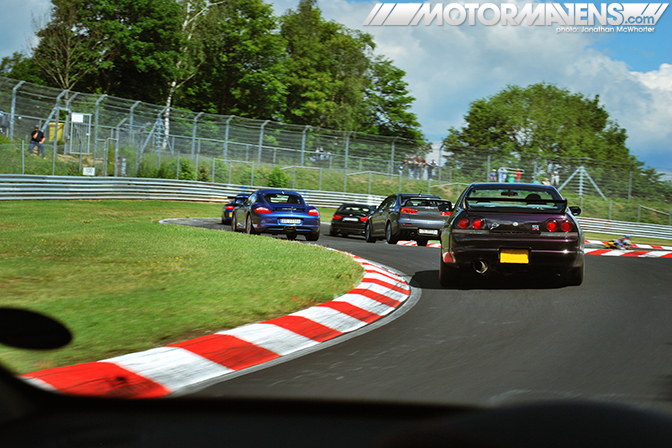 First of all, let me tell you that the Nurburgring is everything you want it to be…and more (for those of you who have not had the opportunity to go). The location is absolutely gorgeous. It is surrounded by lush, green mountains. The B-roads within and around the course are just as twisty and winding as the track itself. And the surrounding countryside, complete with castles and small villages, reminds you that this is a place like none other. Within the perimeter of the circuit is the castle of Nurburg, from which you can see the Grand Prix circuit and have a 360 degree, panoramic view of the surrounding area. It is truly phenomenal! On the outskirts of the track are small villages which have been there for at least a thousand years. And when I say outskirts, I should say that they line the track like beads on a necklace. Poetic, no? 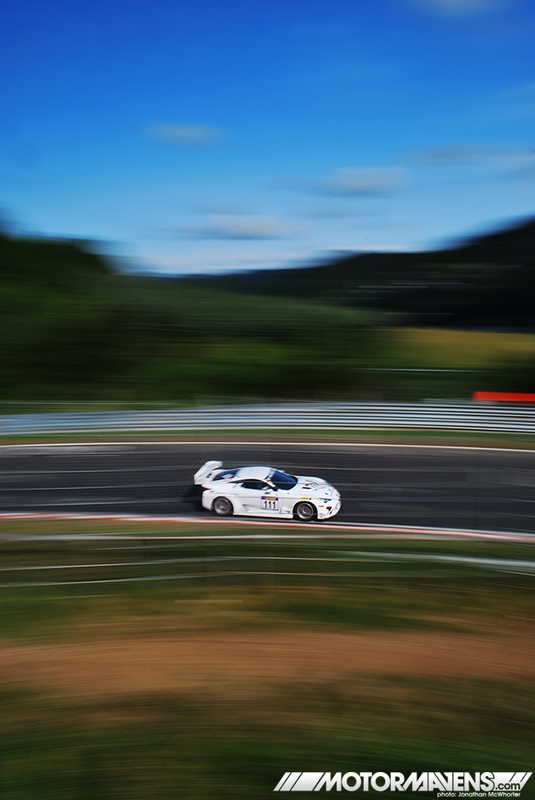 During the very short weekend I got to spend at the ‘Ring, I did about as much as one could feasibly do. All in all: I was witness to multiple qualifying sessions, enjoyed a four-hour endurance race, took advantage of the Touristenfahrten, and had the opportunity to meet some fellow compatriots and ride along in a well-prepared car with a more experienced driver (thanks again, Brian!). Could I ask for more?…Another platter of bratwurst and sauerkraut, bitte? The Touristenfahrten (“tourist drive”) is an absolute must if you ever get to visit this place. It is a simple process: purchase laps to your RingCard, swipe the card at the gate, and off you go. 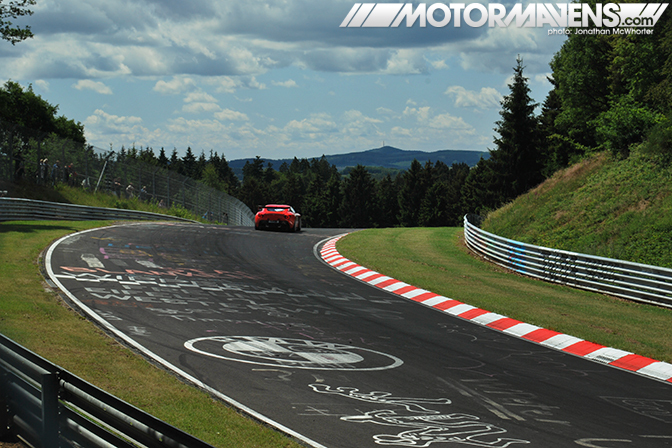 The Nurburgring is a designated toll-road so it is open to the public – when it is open, of course. The weekend I was there was the first weekend that it had been open in a month or so. Needless to say, everyone was itching to get out there on the track. If you have ever been to a Cars & Coffee event, that is exactly what the parking lot for the ‘Ring was like, except the cars were there to get thrashed on. In the above photo, it would seem like the track was pretty crowded. While there were upwards of 300 cars there that day, out on the track we had more room to work with than the parking lots would suggest. This photo should also tell you about the variety of cars there that day. You can see two extremes of Porsche’s offerings, a mid-level BMW, two Japanese staples, and a sport bike. Packs of cars like this would roll by every now and then. What else would you expect from a racing Mecca such as this? Driving the course is probably one of the most incredible things I have ever done in terms of anticipation (I’m a fanboy), thrill, and the actual danger of the experience. Since I was driving an extremely underpowered Renault Twingo, you could probably imagine the obstacle I was for the faster traffic – which means all other traffic. As much attention as needs to be paid ahead of you for the upcoming corners, twice as much needs to be directed behind you because, in less than a second, your rearview mirror can go from clear to fully race-prepped Aston Martin V8 Vantage screaming up behind you – or you’ll have a caged M3 inches from your door in a corner. 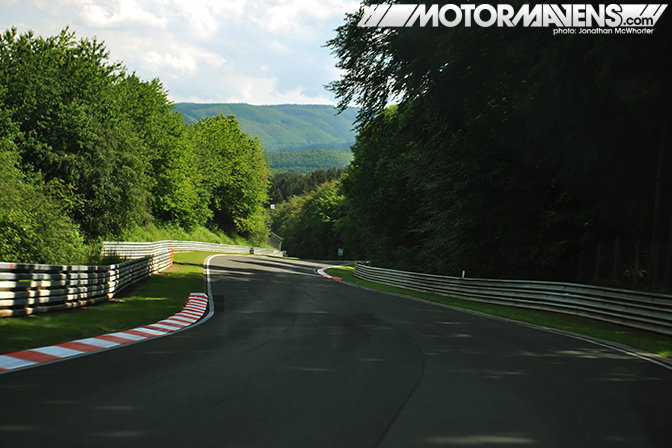 Navigating the Green Hell is not just a matter of cruising along and enjoying the scenery while you stay out of everyone’s way. No, no, no. This isn’t reputed to be one of the most (if not the most) difficult courses in the world for nothing. 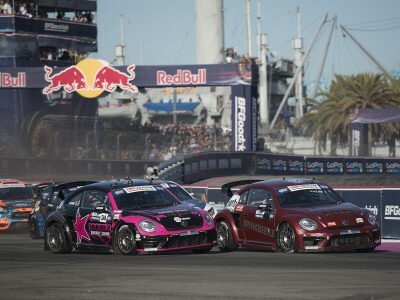 To quickly and safely make it through the turns, it is imperative that you keep your momentum up and follow as correct a race line as possible – especially in a car that has 100HP at best. All the while keeping a sniper’s eye on the mirror and when, inevitably, a faster car comes up on you, acknowledging its presence with a signal, and moving out of the way. Anything less and you will invariably slow everyone down, get in everyone’s way, and be that guy. I was that guy a few times. My dad was definitely that guy, haha! 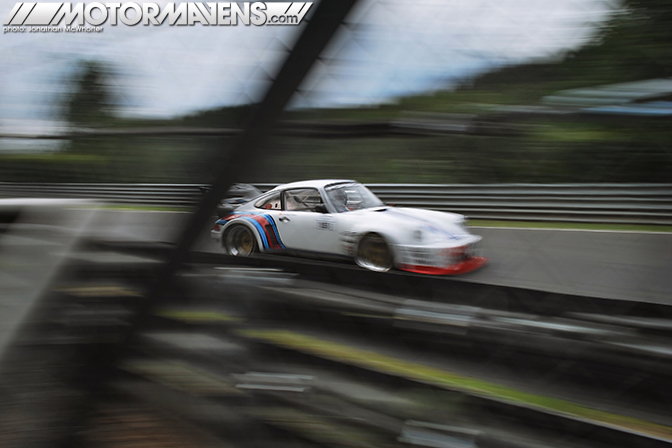 However, we were careful enough not to be one of the many unfortunate souls with their paint smeared on the ARMCO and body panels strewn across the track. During the one day we actually spent on the track itself, there had to have been four or five accidents that we were aware of! Not to mention the big one in the middle of the day that actually delayed the opening of the course for about an hour! I know you might be wondering, and yes, Forza and/or Gran Turismo are extremely helpful when it comes to learning the many turns of the Nurburgring. However, while games like that are a great tool in learning the sequence of turns and general configuration of the course, they do nothing to translate the sheer elevation and intense G forces. The above shot is going through Fuchs-Rohre into Adenauer Forst. This section is very fast and a lot twistier and steeper than video game simulators can translate. The visible section here is already straight down the side of the hill and, where it disappears, the track cuts back to the left and gets steeper downhill still. I didn’t get too many photos on the track itself because, for our first of two laps, my dad was the pilot of our mighty Twingo so that we could acquaint ourselves with the track. This left me as the navigator. We quickly realized that to be less of a danger to others, the Twingo would have to be pushed hard, and to do so I was designated the navigator to call out lefts and rights as well as their severity as we came upon them. Otherwise we would have been sitting ducks with just a matter of time before our rental car was dangling from a wrecker. Being an effective co-driver while providing an extra set of eyes for Porsches and Astons hungry for little Twingos was a handful; thus producing only a few usable shots. When dad and I weren’t fighting for our lives on the track, we were wandering around the surrounding area, enjoying the sights of the small villages and the sounds of high powered engines echoing through the valleys. While browsing the impressive offerings of the parking lot, we ran into a few guys who are stationed in Ramstein. After talking a while and waiting for the track to open, they offered to let us ride along on a lap. Let me just tell you that a well executed Mini Clubman S goes around corners with a quickness. I have a new-found respect for these cars! 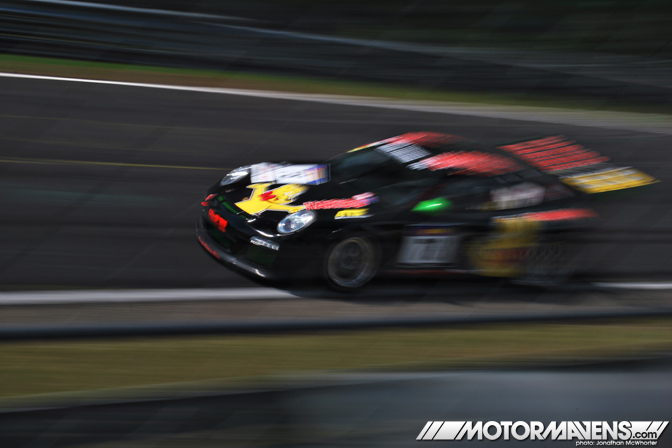 The weekend of our visit was also host to the 51st ADAC Reinoldus-Langstreckenrennen VLN four hour race. 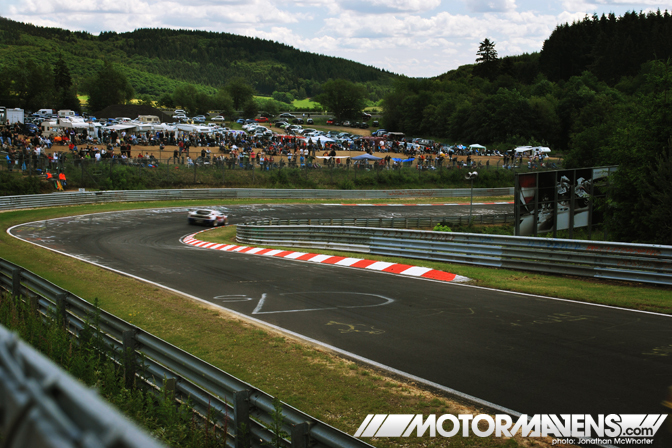 This is a sort of local endurance race series that is held at the Ring. 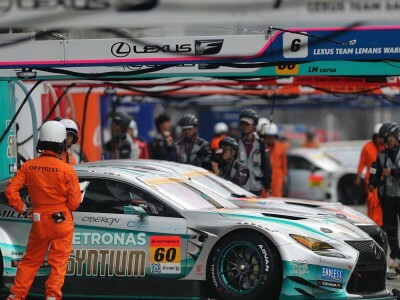 It’s scheduling a few weeks ahead of the famous 24hour marathon at the circuit provides teams with a chance to nail down their strategy, fine tune their vehicles, and work out any last kinks. One thing that I found interesting about the Nurburging is that even though it is absolutely gargantuan in size, it felt extremely accessible. While you are here, you are fully aware of how enormous the circuit is, but as far as I could tell, there were very few restricted locations. In my experiences at tracks in America (speaking from a spectator’s perspective), the track itself feels slightly removed from the spectator and locations to set up camp are limited. Here, however, the entire track is lined with trails and many open areas to put your feet up. 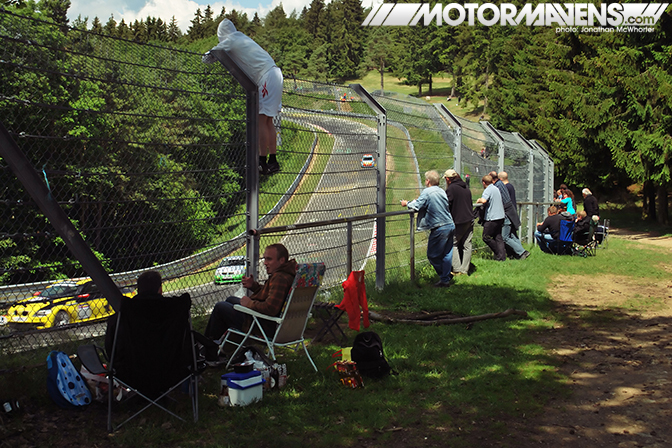 You can get as close to the action as any spectator would want, provided you get there early enough! All of the trails around the perimeter give the spectator a lot of unique perspectives on the track. There are many wide open areas where a lot of people will commonly gather, but in between the trail goes into the forest isn’t quite as open. It’s a surreal experience to be deep in the woods but 100ft away two Porsches are dueling for position. In some places, the trails will be right up on the edge of the course, getting as close as within 20 feet. You can really get the sense of speed that these drivers are carrying through the turns. 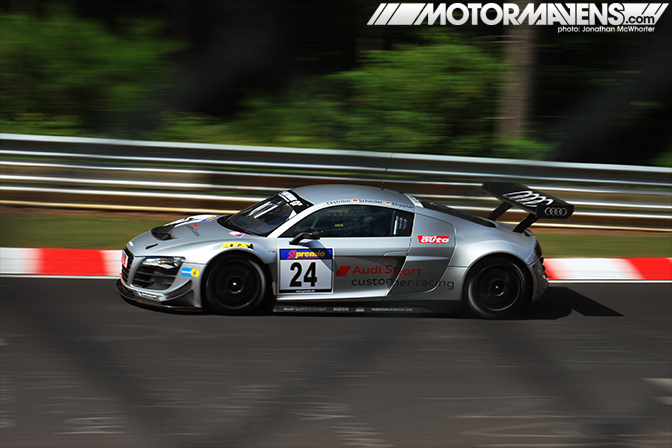 Everyone knows that a finely tuned racecar with a talented driver can do impressive things; but when you’re this close, you can actually feel the cars being pushed to their limits. 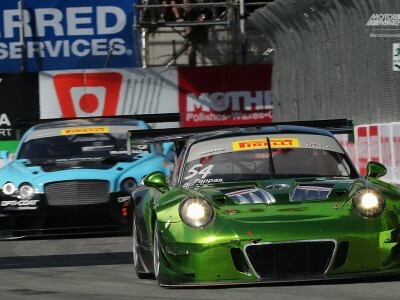 For this particular race, it was the first time that Aston Martin brought out their new V12 Zagato in race trim. In preparation for the 24 hour race, this was their last chance to test the cars and ready the teams for the upcoming gauntlet. BMWs and Porsches were the manufacture of choice for the majority of the grid, but this Audi R8 and a matching Audi TT were unique. Other than them, there were few cars that stood out from the rest of the pack. The R8 has its signature spaceship-esque look, the pair of Lexus LFAs’ screaming V10s could be heard long before they were seen, and there was even a BMW M1 in all of its vintage glory. This might be my favorite shot of that car flying down into Brunnchen, a turn towards the end of the course where a lot of spectators like to watch the action. It was also a fun place to shoot from. Right before this right-hander was a sweeping left downhill, in which the cars would sometimes come down two wide and try to pass. The racing got pretty exciting, too. 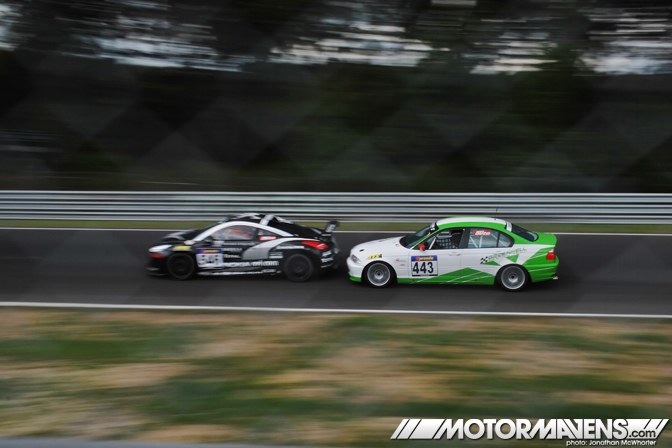 The VLN Race series is primarily for amateurs, so it’s a lot of fun to see guys like this racing their hearts out and competing along side factory-backed teams. My first visit to the Nurburgring was incredible. Everything I encountered went above and beyond any expectations I had of this place; and trust me, my hopes were high. If you ever have the chance to pay a visit, please do. You would be doing yourself a disservice by not experiencing it firsthand. If you’re curious about the sticker pictured above, I’ll give you a little background. 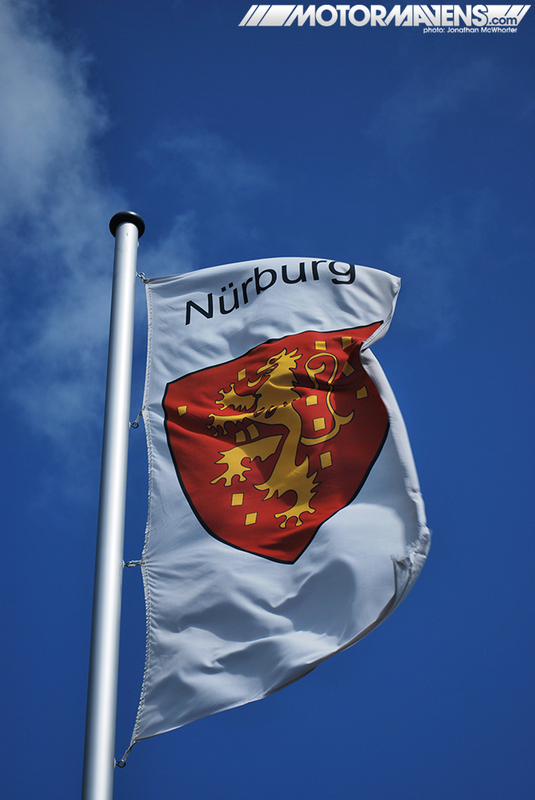 The Nurburgring, initially state-owned, was rented out to two private investors (with no motorsports background) and they have since sent the Nurburgring into massive, massive debt: approximately 400 million Euros worth, based on fabricated visitor numbers and false projections. What this means, in a nutshell, is that the future of the Ring is in danger. Prices are rising and the local economy is suffering. I’m normally not one to get too involved in politics, but after visiting this place and seeing just how unique it is, I feel inclined to at least spread the word. You can form your own opinions there. 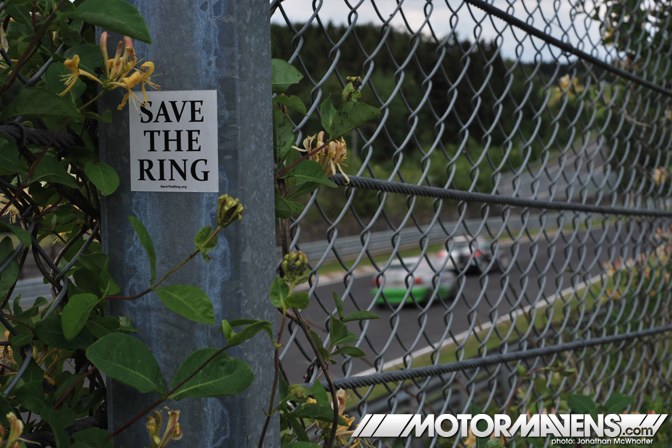 If you want to learn more, or find out what you can do, please visit Save the Ring‘s website. This is just MY story from my first visit to the legendary Nurburgring, but I’m sure plenty of our others that read this website have been there… probably numerous times! I invite you to share YOUR story with the readers of this site, because I know I’d love to hear it, and I’m assuming lots of our readers would too. You can type your story in the comments field below. OR if you like, leave a comment to let us know if you’re interested in getting a login name/password so you can show off your photos AND story of your trip to the Ring! Loved your story, JMac! It brought me back to the great memories I had from MY first trip to the Ring! Maybe I should do a similar writeup! Hmm…. Also, I gotta say, I LOVE the photo you snuck in of the Lexus LFA lapping the Ring! Was it a test day? Did you happen to get any more photos? DETAILS man!!! 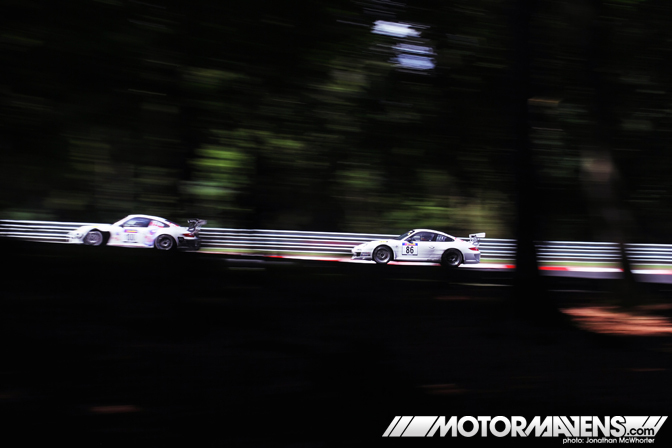 Oh, but I REALLY loved the capture of the two Porsches chasing each other, taken through the dense trees surrounding Nordschleife. Outstanding way to frame an action shot. Love it! #86!!! Great writing! You managed to bring all of the emotions of a trip to the ring to the reader! Very well done. I completely agree with you. This should be #1 on every car fans bucket list. 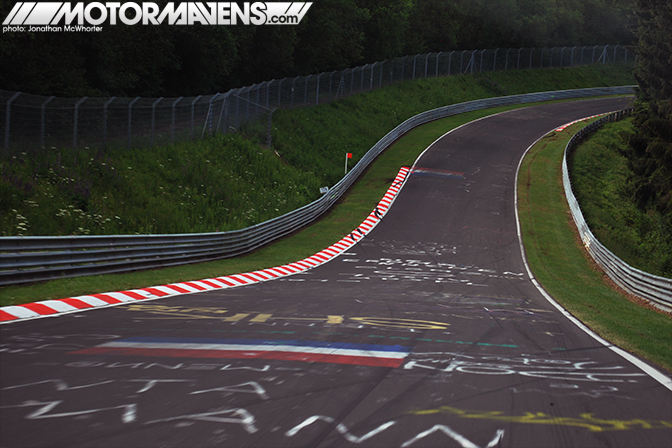 This is the place that got banned from the F1 circuit because it was deemed to dangerous for its drivers. Our first trip out is going to be April 15th this year and it should be wild. Completely different car this year. Our invitation still stands. If you ever want to come back. Well put you up. 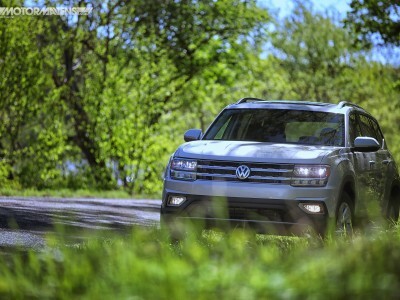 Great write up and thanks for the name/car drop!